Autumn is always an introverted time for me. I get deep into my creative projects. This season especially I’m feeling a powerful inspired force pulling me into action. I’ll pick up a handful of ingredients and, while talking to my best friend in my kitchen, almost unconsciously make something wonderful. Yesterday it was a chèvre and mushroom tart. Then it was garlic einkorn biscuits. The other day it was chai teff porridge. I don’t know where this energy comes from. Call it a genie, a muse, the flow. Whatever. It lives in my kitchen and talks to me through food. Some nights it’s like magic. I take note of what I’ve got on hand, synthesize a possibility, and go. Out comes a thing. A delicious thing. I mean, not always. Sometimes it’s just pretty ok. Or passable. When the Spirit / inspiration doesn’t show up to help me make whatever it is. But lately most of those makings have been exceedingly good. When Gena of Choosing Raw and the Food52 column The New Veganism contacted me about possibly posting a recipe for WFFF from her new book, Food52 Vegan, you can guess my reaction. Somewhere along the lines of OH HELL YES. Gena’s column is kind of genius. As if possibly she too has a genie that lives in the walls of her test kitchen. Telling her how to make creamy harissa mayonnaise with cashews. How to make a vegan chocolate cake as delicious as a butter filled one. Ok, maybe it’s all her. But is it crazy to think that maybe our muses are at least friends? Plus she’s kind of in the vegan cool kids club in my mind. I felt like we were in high school and she had just invited me to eat lunch with her. Like, suddenly she’s picking me up to go to the mall with her cool arty friends and we’re going to make fun of the jocks while drinking boba tea and shopping for pleather. Food52 Vegan is everything I dig in a staple cookbook. It’s concise (60 recipes). There are plenty of gorgeous photos. The recipes are creative and inspiring. And, despite being “vegan,” it’s neither preachy nor inaccessible. It’s a great primer for cooking plants for anyone. Throughout the book Gena shares her simple tips and techniques for making plant based cooking stellar. Including primers on tofu, tempeh, nut milks, whole grains, coconut oil, nutritional yeast, egg replacers, sweeteners, the works. Reading through the book I found myself saying “right on!” to myself, under my breath, alone in my kitchen. I can’t wait to dive into more of the recipes (lentil sloppy joes! butternut squash mac & cheese! ginger carrot bisque!). 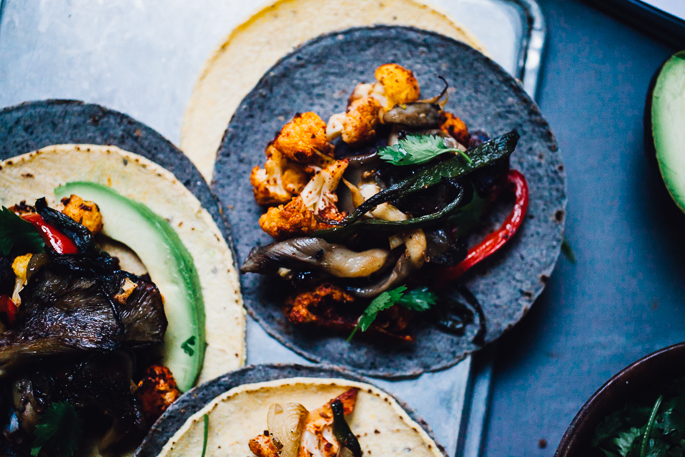 I love that these oyster mushroom & cauliflower tacos are so substantive, tender, and meaty all at once. The cauliflower is heavily spiced, savory, and smokey — roasted until blackening at the edges. I used a mix of purple and golden cauliflower for my tacos. I just love the rainbow of colors in the final dish. Poblanos, red pepper, caramelized onions and oyster mushrooms cook up together into a juicy, toothsome mix. Lime & cilantro brightens everything up. I had to top it with avocado and hot sauce, of course. I mixed up a super quick, lightly alcoholic pomegranate kombucha gin rickey to drink alongside it. It was something along the lines of 1 cup ginger kombucha, 1 oz Boodles gin, 1/2 teaspoon St. Germaine, 2 oz pomegranate juice. Reprinted with permission from Food52 Vegan, by Gena Hamshaw, copyright © 2015, published by Ten Speed Press, an imprint of Penguin Random House LLC. // I changed only a few small things from the original recipe. I used a mix of purple and orange cauliflower (because those colors!) and I added avocado and hot sauce at the end. My trick for packaged corn tortillas is to steam them over a pot of hot water briefly to soften them up. It makes them more pliable. Then I double layer the tortillas before filling them with veg. It keeps them from splitting in half in the center when you fold your taco. Preheat the oven to 435F (220C). In a large bowl, toss the cauliflower florets with 2 tablespoons of the olive oil until evenly coated. Sprinkle with the chili powder, paprika, coriander, cumin, red pepper flakes, and a generous pinch of salt. Toss again until the cauliflower is evenly coated. Spread the cauliflower on a rimmed baking sheet. Heat the remaining 2 tablespoons of olive oil in a large skillet over medium heat. Add the onion, poblano, and red bell pepper and saute until the onion is tender and a bit golden, about 15 minutes. Add the garlic and saute for another minute. Stir in the mushrooms, then season with salt and pepper. Cook until the mushrooms are tender and crispy (5 to 8 minutes). Remove from the heat and stir in the lime juice. Taste and adjust seasonings as desired. For each taco, put 1/4 cup (60ml) of the mushroom mixture in a tortilla. Top with some of the roasted cauliflower and a tablespoon of cilantro. Optional: top with avocado slices and hot sauce, to your liking.